Weatherquest meteorologists have decades of experience in the media industry. From years of broadcasting expertise on television and radio to compiling newspaper forecasts and written reports we can cover any of your media needs. We are also happy to give expert quotes whenever any weather-related questions arise – free of charge if you have a service with us, and if you don’t you can always call us on our Premium Rate Phone line. 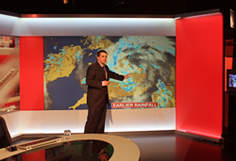 We also have years of experience providing briefing services in spoken and written format to weather presenters. Our forecasts can also be seen in several publications including The Times, The Times International (in Europe), The Eastern Daily Press, The East Anglian Daily Times and the Evening News.